People who exercise and stay active feel better, regardless of their age. Exercising regularly not only improves the body, but also the mind. When the body feels excessive stress, it goes into a “fight or flight” response which releases cortisol into your bloodstream to help deal with your body’s response. However when you experience frequent high stress, too much cortisol in your body over time can bring on weight gain, hypertension, and headaches and even increases your risk for certain diseases. However exercising reduces the effects of stress and makes you feel better by releasing endorphins that serve to counteract the cortisol, thus improving your mood and giving you that post-workout euphoric “high”. As we age our brain starts to shrink, especially the hippocampus area which is where memory and learning takes place. But exercising actually slows down cognitive loss by increasing production of new brain cells to help offset the ones naturally dying off. While the greatest benefit is reaped by exercising between the ages of 25 and 45, exercising at any age is beneficial. Excessive stress can cause us to engage in risky behaviors such as smoking and abusing alcohol or prescription drugs to help reduce the effects of stress. However, while usually meant to be “experimental” and temporary, their use can quickly turn into an addiction. Depending on what you are addicted to can have serious health consequences. As noted above, exercising reduces stress and therefore decreases your risk of an abuse turning into an addiction. We know exercising boosts brain activity. Studies show that exercising can raise your creative ability for up to two hours after working out. You could use that post exercise period to draw, paint, photograph or otherwise exercise your creative spirit. By exercising not only will you look better with toned muscles, but you will feel better too. Regardless of weight, gender, age or physical fitness level, exercising lifts your self-esteem and makes you feel good about yourself. And if you have a positive self-image, your radiance will exude to those around you making them feel better about themselves also. Cardio and strength training are two types of exercises to slow down the aging process, but don’t overlook yoga too. Yoga is a favorite among seniors because it is low impact, so it is easy on the joints. It also increases flexibility and improves balance, thus reducing your risk of falling and breaking a bone. 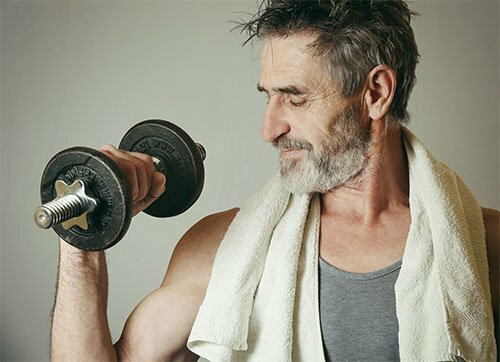 Many seniors overlook the mental benefits derived from physical exercise. Not only will working out improve your looks and how you feel about yourself, but it will keep your mind sharp too.